Macpherson Road is not somewhere that I will go often for a meal but after visiting New Taste Restaurant (新嘉飨), it seems I have more reason to do so now. Helming the kitchen is 26 years old Chef and co-owner Cao Yong 曹勇. Cao Yong is a new citizen having come to Singapore with his parents when he is 15 years old. 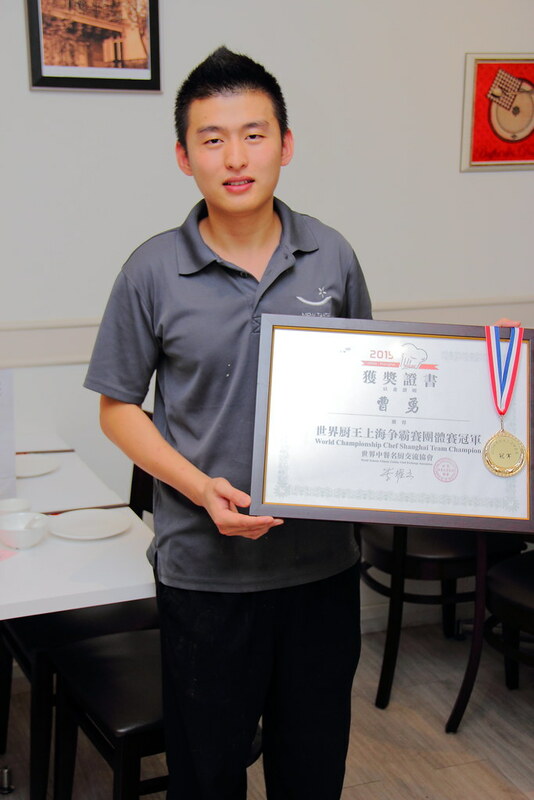 Just recently this year, Cao Yong represented Singapore in the World Chef Championship in Shanghai (世界厨王上海争霸赛) and came in first place in the team competition. He is also the team leader of the 4 men team that made Singapore Chinese cuisine proud beating teams from other countries especially China. Dinner at New Taste Restaurant started with some appetisers. We had the Chilled Pork Belly with Garlic Sauce ($6.90) and Smoked Duck with Pickled Ginger ($8.90). 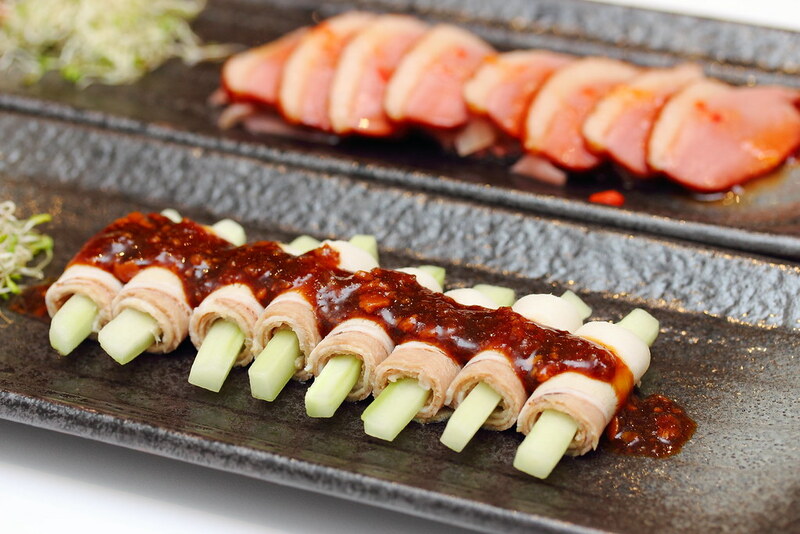 The chilled pork bell paired with the cucumber whetted up the appetite with its refreshing and crunchy finishing. The smoked duck was tender and flavourful. Eaten together with the pickled ginger, it helps to cut through the greasiness and gaminess. 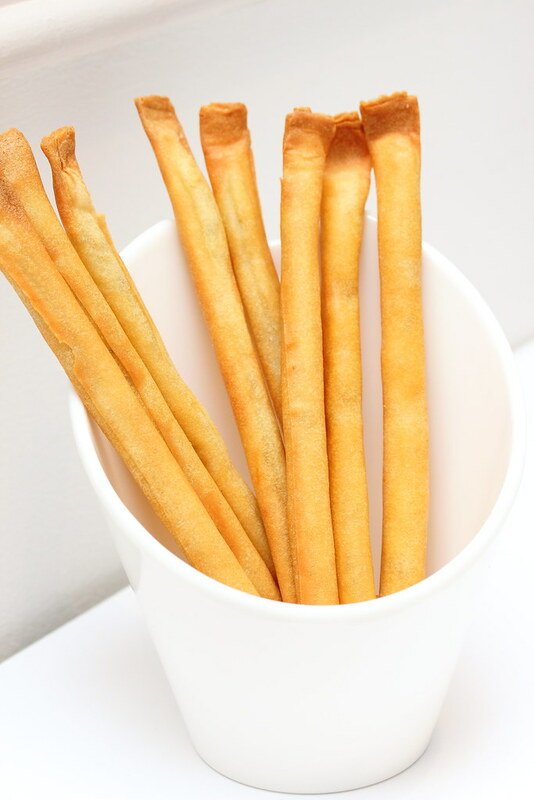 The Handmade Crispy Long Cheese Stick ($12.90) will be enjoyed by both the young and old. The cheese stick is filled with a mixture of cheese and potato. I was telling my dinner friends that it actually felt like eating samosa but in a stick form. I know of one Chinese restaurant that serves the Vegetable Juice ($4.90) but it was off menu. Hence I am very happy to find it at New Taste Restaurant and it does it even better. 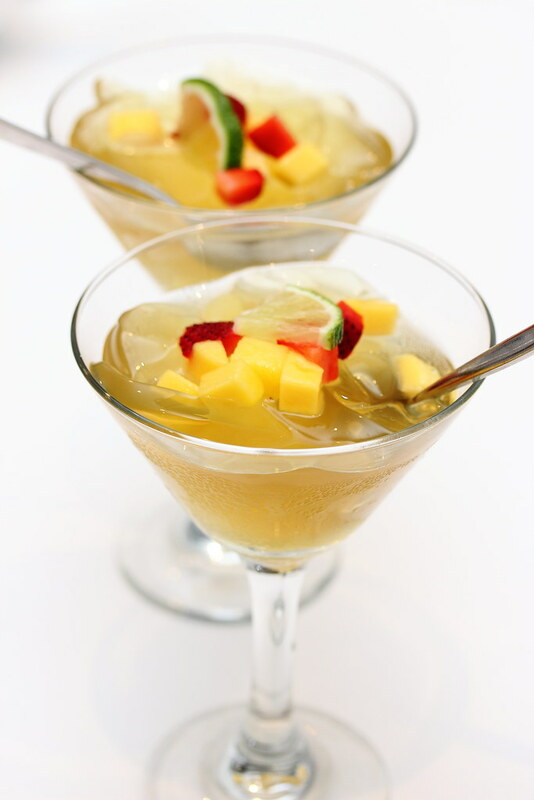 The juice is blended together with Hong Kong Cai Xin, Pineapple and Sour Plum. 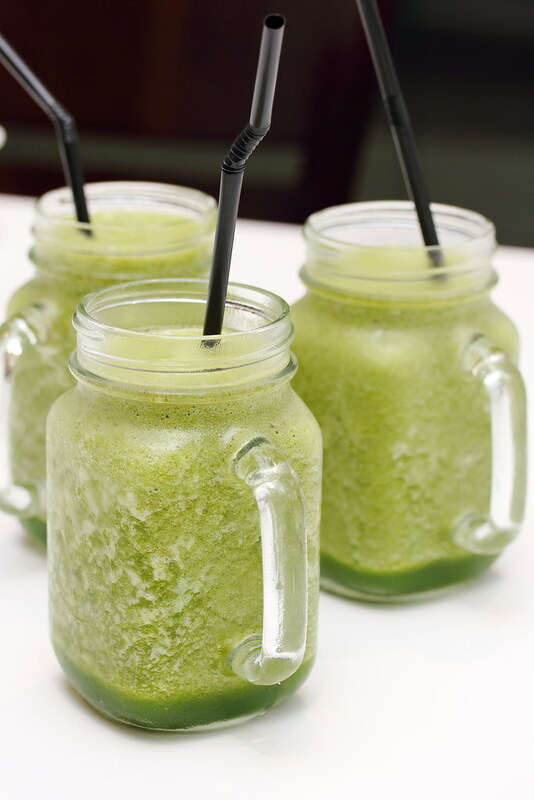 The other partner of the restaurant explained to us that the white cloudy appearance of the juice shows that it is freshly blended. This is a very refreshing drink especially for the humid Singapore weather. It does not have that earthy vegetable taste at all. 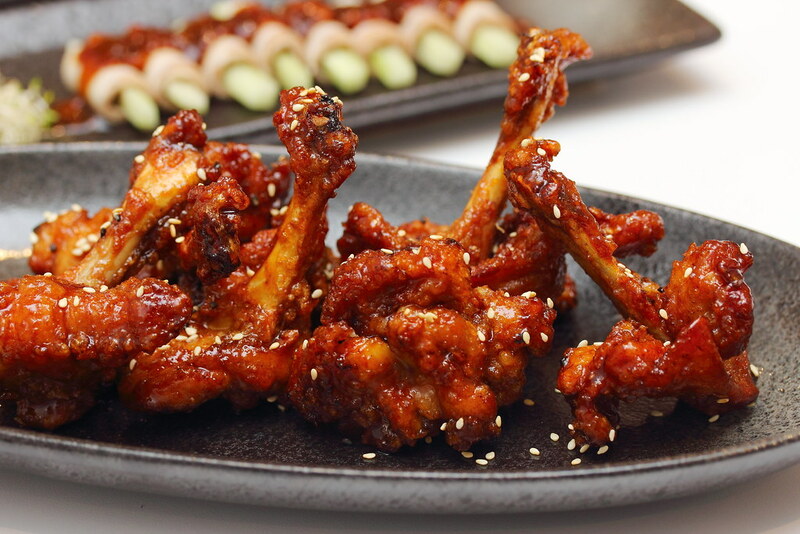 Moving on to the mains, we started with the Marmite Chicken which is fried to crispy. The sweet marmite marination topped with sesame seeds is quite enjoyable with the sweet bitter aftertaste. 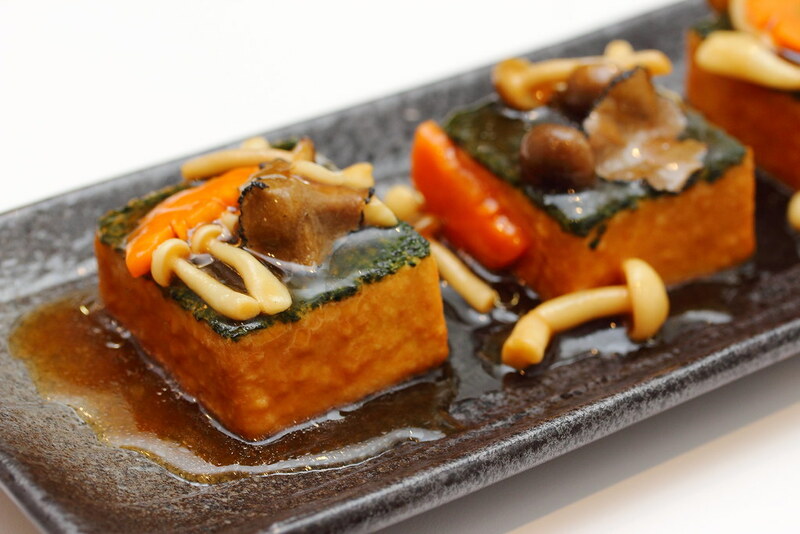 The Deep Fried Spinach Beancurd with Fresh Mushroom and Black Truffle ($12.90) is a classic dish with the homemade silky beancurd. The earthy black truffle seems to give it an additional layer of flavour with the carrot and mushroom providing the extra texture. 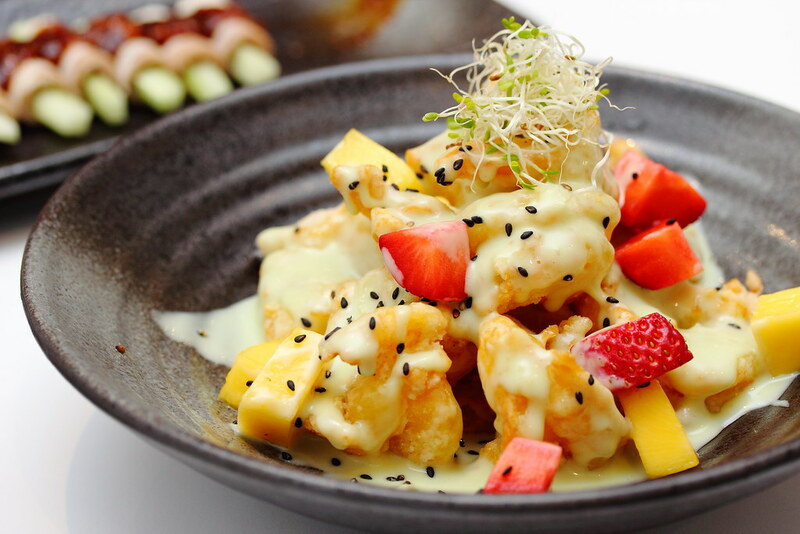 The Crispy Fried Prawn, Fruit Salad with Wasabi Cream ($21.90) received mixed reviews. The huge prawn was fresh and crunchy. However I find the wasabi cream was on the sweet side missing the pungnet wasabi kick. 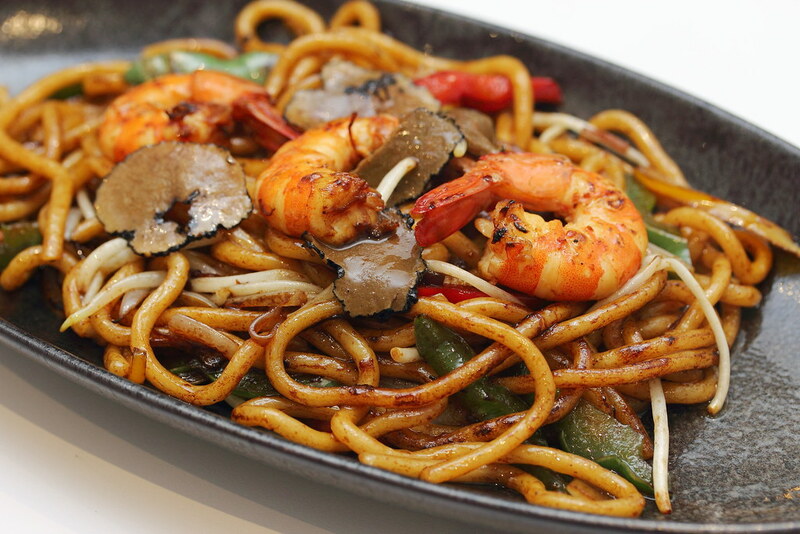 At New Taste restaurant, besides the eclectic selection of cooked dishes, there are also one meal dish such as the Stir Fried Udon with Homemade XO Sauce and Black Truffle ($12.90) for those that just one to grab a quick meal. I understand that it is not easy to stir fried udon if the chef does not have a good control of his wok. The noodle can end up too soft or lumpy. My plate of udon turned out to have a nice wok hei with almost al dente bite to the udon. The highlight at New Taste restaurant has to be their Signature Crab Porridge that is good for 2-3 pax. Currently it is having promotion at $19.90 (usual price $39.90). 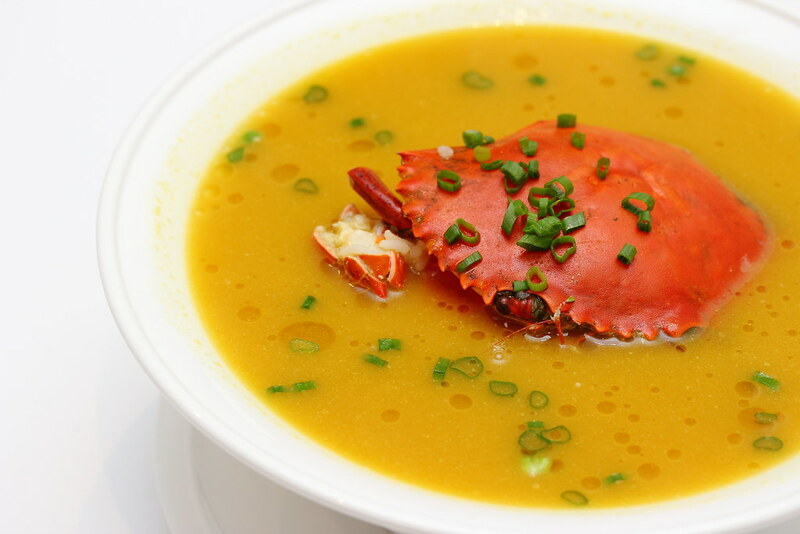 The huge bowl of porridge comes with a whole mud crab. The porridge is the grainy type like Teochew porridge. 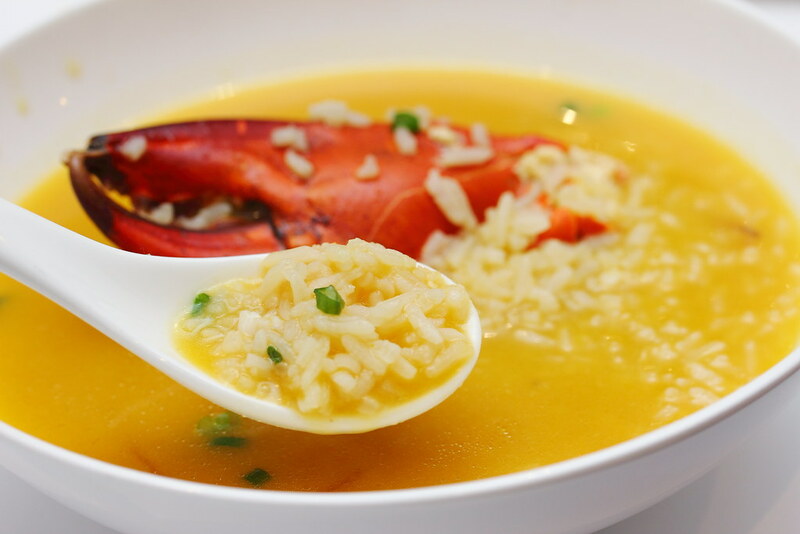 What made the crab porridge so delicious has to the broth that is cooked with chicken stock and pumpkin. I think I can eat his everyday. Dinner at New Taste restaurant finished on a sweet note with the Lemon Glass Jelly ($3.90). It was a refreshing and light dessert to finish the dinner. If the lemongrass flavour can be more distinct will be perfect. New Taste Restaurant is actually split into 2 sections. One section offers ala carte dishes of modern fine chinese fare at affordable price, the other section offers steamboat buffet. Great news to readers of SG Food on Foot. 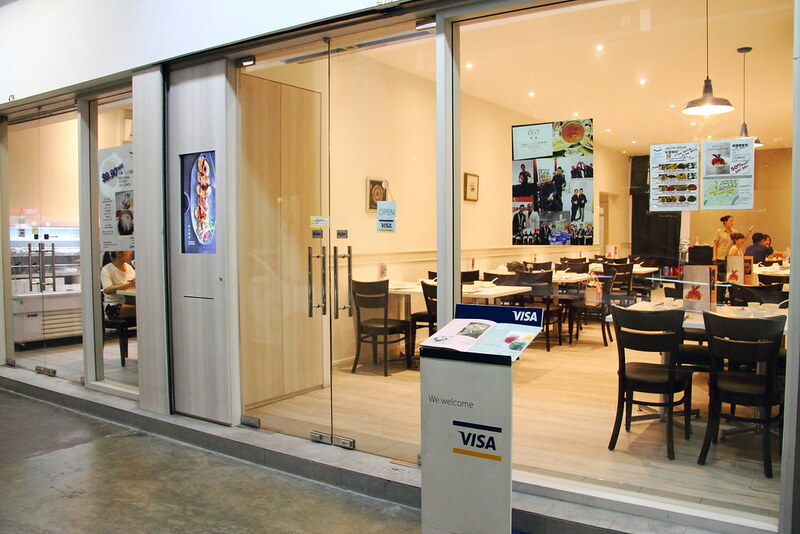 You just need to show this article to the staff of New Taste Restaurant to enjoy a discount of 15% of your total bill (except for promotional items), valid until 30 November 2015.